Since Hurricane Florence dropped more than 30 inches of rain on parts of North Carolina, Policy Watch’s Lisa Sorg has been dutifully tracking the environmental catastrophes — many of them, quite simply, predictable in nature. But if you missed it, Duke University law professor Jedediah Purdy authored an illuminating take Tuesday in The New Yorker on the environmental injustices made apparent by the storm, and its deleterious effect on agricultural operations in the state. It is unsettling, and maybe emblematic of many American lives today, to perch safely but uneasily on the edge of catastrophe. Rainfall in eastern North Carolina passed thirty inches during Hurricane Florence, cutting off the coastal city of Wilmington from road access, and this week the state’s rivers are swelling as they return the water to the Atlantic. The Neuse River is menacing Goldsboro, home of the Reverend William Barber’s congregation, and the Cape Fear River is swamping Fayetteville, near Fort Bragg. The storm has killed at least thirty-two people. It left my neighborhood in Durham, a hundred and forty miles inland, damp and ruffled by breezes. Warm humidity streaked the outside of air-conditioned windows with condensed water, and people stayed indoors watching weather updates. But we prepared here—overprepared, even. The city of Durham shuttered its non-emergency offices last Thursday afternoon, and public schools closed throughout the Research Triangle. The University of North Carolina at Chapel Hill and Duke, where I teach, shut down classes for nearly a week and urged students to evacuate. Big-box stores were stripped of water, batteries, and other emergency supplies, and gas stations were empty. At home, we stockpiled jugs of water, dried fruit and canned beans, candles. Disaster planning requires an accounting of everyday dependencies. How far can we drive if there is no gas for sale? Without electricity, how many hours of light do we have? If the stores aren’t restocked, when will we run out of food? Once our phones aren’t working, how many phone numbers do we actually know? How many of the people we know live within walking distance? As we pull the plug on one vital system after another, tasks that seemed straightforward—making a cup of coffee, or washing clothes—turn out to be a note in a technological symphony. A “natural disaster,” then, is at least half non-natural, the product of a natural event and the infrastructure that it floods, shakes, or ignites. In North Carolina, much of that infrastructure is agricultural: over the past thirty years, the eastern part of the state has become the slaughterhouse of the East Coast. At least nine million pigs live here, mostly in “confined animal feeding operations” that contain thousands of animals apiece. Operators cure pig feces in open-air “lagoons” near the crowded barns where the animals spend their short lives. Poultry farms, which use the same model, are also widespread. In September of 1999, Hurricane Floyd’s floodwaters drowned a million chickens and turkeys and a hundred thousand hogs in eastern North Carolina, and sent a hundred and twenty million gallons of their waste into the region’s rivers. State officials marshalled incinerators to burn the corpses, and contamination persisted in waterways until the spring. After that catastrophe, the hog industry got more careful about where it located facilities, and state lawmakers toughened environmental standards for new operations. 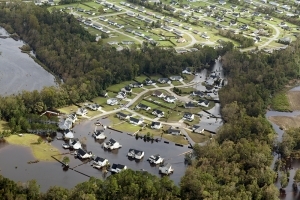 But climate change has increased the vulnerability of North Carolina’s low-lying eastern plain, expanding the size and water mass of hurricanes by as much as fifty per cent, with ocean levels creeping up. Meanwhile, a Republican-dominated state legislature cut taxes and took other measures that blocked the development of a more resilient infrastructure. A 2012 statute initially forbade state planners to take climate change into account, out of fear of burdening developers in storm-prone areas; the legislature only softened it when the Republican governor’s office made clear that it would not make life harder for coastal builders. Florence, now headed north along the Appalachian Mountains, dropped well over thirty inches of water, compared with Floyd’s twenty-four inches. On Monday afternoon, North Carolina Secretary of Environmental Quality Michael Regan reported that his office knew of one waste lagoon that had been breached, five that had spilled over their dams, and two that had been inundated by nearby bodies of water, blending their waste with the flow. The state is not yet able to send inspectors into the flooded areas, and waters are still rising. Around the time that Regan spoke, the Waterkeeper Alliance, an environmental group, sent small planes over the flooded area. One staffer’s Facebook post described “a disaster. Many many hog and poultry facilities under water. Many dead animals.” On Tuesday, the North Carolina Pork Council counted twenty-six damaged lagoons, and Sanderson Farms, a poultry integrator, reported that 1.7 million birds had died in its contractors’ barns. The contamination that follows the flood will fall unequally on North Carolinians. The pork industry is rich and politically influential, and in the past two years the state legislature has changed state law to protect hog operations from suits by neighbors whose health and property are damaged by pollution. This is nothing new. The modern environmental-justice movement was born in Afton, North Carolina, in a fight over the state’s decision to dump contaminated soil near a poor, historically African American community. Wilmington and other down-east towns carry the burdens of Superfund sites and coal-ash ponds, which hold the toxic by-products of coal-fired electricity. A coal-ash landfill near Wilmington has already been breached by floodwaters, though no one is sure how much toxic material has escaped. As usual, many people have been extraordinarily good to one another. In Durham, during the long period of waiting and a spate of flash foods as the storm left the region, neighbors checked in on one another, young people showed up to stay with the elderly, and trays of cookies and empanadas went from door to door. Down east, volunteers are getting to flooded houses in their personal boats, pulling people out of danger. When attention to the hurricane fades, much of what gets rebuilt will continue to be dangerously vulnerable to a warming world, and will share out its dangers unequally. On Monday evening, a double rainbow appeared over Durham’s gentrified downtown, while the Neuse and Cape Fear rivers surged toward their peaks.